Rooibos tea health benefits are quite numerous, making this red tea a healthy and delicious alternative to the more traditional green and black teas. Rooibos tea, also called red tea, comes from a small shrub that only grows near Cape Town, South Africa. Naturally caffeine-free and sweet-tasting, the reputation of this healing tea is spreading throughout the world. Here are some of the reasons why. It contains powerful antioxidants. Antioxidants are powerful health components able to protect the body from free radicals. This helps slow the aging process, reduce inflammation, and decrease the chance of heart disease and cancer. It may help protect the body from cancer. Studies by the Cancer Association of South Africa has found rooibos tea to be filled with anti-cancer compounds, leading them to recognize rooibos tea as a leading source of natural anti-cancer chemicals. It helps eliminate acne. Rooibos tea contains healing phenylpyretic acid, which helps reverse acne, eczema, and psoriasis. It supports healthy digestion by relieving vomiting, nausea, and diarrhea. It works so quickly to soothe upset stomachs that many parents use it to treat colic and stomach cramps in infants. It benefits insomnia. The next time you have trouble sleeping, you may want to reach for a cup of rooibos tea before a prescription sleeping pill or other over-the-counter sleeping aid. The high mineral content and lack of caffeine help you relax and fall asleep. 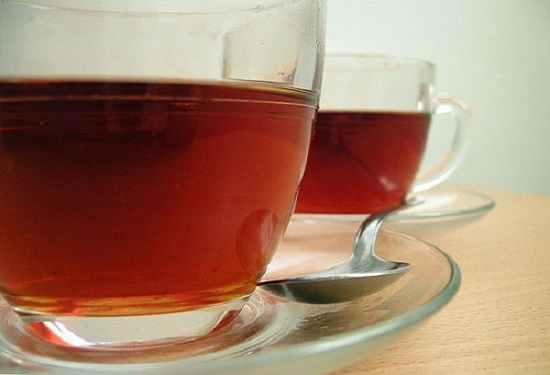 There are so many Rooibos tea health benefits, but are there any side effects or other risks? Current studies haven’t found any side effects or other risks. However, you should always check with your healthcare professional to find out how much is safe for you, especially if you are taking prescription medication, are being treated for (or have a history of) cancer, or have liver or kidney issues. You should also check with your healthcare professional before giving it to infants or children, or drinking it yourself if you are pregnant or nursing. Isn’t it time to experience the many Rooibos tea health benefits yourself? The numerous Rooibos tea health benefits make it a favorite choice of many. It’s wonderful, sweet flavor and beautiful red color delight the senses. This tea is so versatile, with each sip your taste buds and your body will thank you! As a naturally caffeine-free herbal tea, it’s a great choice for anyone wanting to avoid coffee or other forms of caffeine. It can be found in a variety of amazing blends or simply enjoyed on its own. You can find it in health stores or online at Amazon.